Yisrayl Hawkins’ teachings from the 90s, Going On To Perfection, continue to inspire our efforts to be in unity with Yahweh. Yahweh is One. Yahweh is Unity. The only way to have peace and solve all the world’s problems is through the keeping of Yahweh’s 613 Laws of Peace. II Corinthians 10:5 … bringing under control every thought… is what Yahweh’s People strive to achieve in obedience to Yahweh’s Laws, Statutes, and Judgments – the 613 Laws of Peace. Future Priest Buffalo Bill was this Sabbath’s first teacher. His topic, entitled Repent for the Kingdom of Yahweh is at Hand was spot on with the message of the Last Days’ House of Yahweh. Choosing to speak on the four unique rainbow colors, recently seen by Yisrayl Hawkins, Bill tells us each color describes a developmental stage of The House of Yahweh, proving that Yahweh is fulfilling His promise as recorded in Genesis 1:26. The future priest focused on the first color, red, and he referred to it as the Red Stage. He stated that this stage represents our Great Teacher, Yisrayl Hawkins, teaching us to repent. Pastor’s message to us was, as it states in II Corinthians 6:17, to come out from among them and be separate. “Be separate” holds the meaning of coming away from our former, sinful lifestyles. The future priest asks us where else, other than the re-established House of Yahweh, would we find The Teacher, the One Sent, Yisrayl Hawkins, teaching the difference between the clean and the unclean, the holy and the profane? He gave supporting verses in Zecharyah 5:9, 6:12. 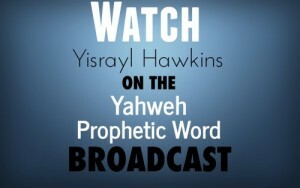 He provided a visual reminder of where we once were and what we needed to submit to, study, learn, and obey, in our early years, by showing several literary works of Yisrayl Hawkins: The Mark of the Beast, Deceptions Concerning Yahweh’s Calendar of Events, Devil Worship, and Unveiling Satan. No coincidence, for each of these books has a red cover denoting the fact that our sins were as scarlet, hence the Red Stage. Bill reminds us to continue in obedience and repent for indeed the Kingdom of Yahweh is at hand (Luke 13:5, Acts 3:19). He encourages us to re-visit Yisrayl’s words in both The Reverence of Yahweh series and Going on to Perfection. In conclusion, we recognize that “putting on airs” with “high and mighty looks” is worthless. The keeping of Yahweh’s Laws is priceless, therefore strive to practice what we have learned in The House of Yahweh and keep and teach Yahweh’s 613 Laws of Peace – it is the peaceful solution to solve all problems.